Remy has no memories of his parents. Born in New Orleans with unusual eyes - red irises on black sclera - it was because of his unique eyes that he was snatched from the hospital shortly after birth. It was believed that he was the fulfillment of an ancient prophecy for the even older Thieves Guild. In those early months, he was under the guardianship of a person known as the Antiquary. Jean-Luc LeBeau saw the child and could not abide the thought of him being raised a relative slave. LeBeau struck a bargain with the Antiquary to free Remy. He was placed into the care of fellow Thieves' Guild member Fagan's group of child-thieves to grow. Existing on the streets is a tough life and worse for a child. Remy showed his instincts were strong and he was a survivor. He was determined to make his way, humble though it was. Eating from discarded meals and scraps, ducking out of sight to avoid the tougher gangs that beat up the smaller and weaker. He watched other members of the Thieves' Guild as they picket pockets and robbed to get their ill gotten gain. Learning from an early age the laws of the street, he also turned to picking pockets though he was no instant success. Once he perfected his techniques, he was able to carve out a living for the next several years. When ten, Remy crossed paths with Jean-Luc LeBeau once again - he tried to pick the man's pocket. He almost succeed and it was from this encounter that LeBeau decided Remy was mature enough to bring under his wing. He adopted the boy and began instilling in him the ways of the Thieves' Guild and about their rivals, the Assassin's Guild. Nothing changed as far as Remy's behavior; he continued to stir up trouble across the city as any street-rat his age was wont to do. However, being favored by the Guild master has its own price — the rest of the guild treated him as an outcast and it wasn't until he met a young girl named Belladonna that he had his first true friend. It turned out that Belladonna was the daughter of the Assassin's Guild-master. The two were fast friends into their teens. Remy, echoing the trouble that was sure to haunt him his whole life, fell in love with Belladonna. He was able to learn a lot about the Assassin's Guild from the long talks and time spend with her. By Remy's mid teens, he was given his Thieves' Guild rite of passage to prove he was worthy of his place in the Guild. It was also known as the Tilling and his Guild-friend and Half-brother Henri was his sponsor. In his case, he was to steal a gem known as l'Etoile du Tricherie. The l'Etoile du Tricherie was in the possession of a woman named Geneiviere Darceneaux, the daughter of a jewel thief, in France. Using his ever strengthening mutant powers, Remy used his charm on her, causing her to fall in love with him. However before he could make his escape with the gem, Sabertooth showed up - also tasked with reclaiming it for its previous owner, a man named Herzog. He was bested by Sabertooth who then captured Henri and Geneviere and secured them to a spire of Notre Dame. Forced to make a choice, Remy saved Henri but let Geneviere fall to her death while Sabertooth made his escape with the gem. Returning to New Orleans, it wasn't long before the Thieves' and Assassin's Guilds decided to try and make peace work between them. Their solution was to marry Remy and Belladonna, though it had actually been arranged years before when the two became friends as children. Unfortunately even the best laid plans, and those done with the best of intentions, often fail to work out. In this case, Belladonna's brother Julien refused to accept the peace treaty and challenged Remy to a duel after the wedding - Remy killed him. Even though he was just a pawn in the situation, he was held responsible for killing the son of a Guild master and they opted to banish him so that the peace might hopefully work. Remy left without even offering Belladonna the chance to go with him. Remy began to wander the world, plying his trade as an increasingly skilled thief while using his ever growing mutant powers to aid him. It was during this time that Mr. Sinister approached the cocky young thief with the proposal to help him control his powers. An operation was performed to remove some of Remy's brain tissue. It succeeded in curtailing the growth of his powers and allowed him to better grasp and wield them with consistency. As a result of this "offer", Remy began to work for Mr. Sinister and stole many items for the man. The final task was to assemble a team of hunters and assassins to be called the Marauders. Remy was either too naïve or too over confident (perhaps both) to realize such a team could only be assembled for ill purposes. That purpose was to wipe out the Mutants calling themselves the Morlocks and lived under New York City. Remy had led them right to the Morlocks and watched in horror as the Marauders began to exterminate them. In his attempt to stop them, Remy was nearly killed by Sabertooth, who he'd reluctantly recruited to be a part of the team. Unable to stop the brutal act, Remy escaped while only able to save the life of one young Morlock girl named Sarah. Sarah would later grow up into the Mutant and X-Man known as Marrow. Mr. Sinister, finding Remy's debt 'paid', returned the grey matter from his operation to him in a vial as a symbol of his completed service. Freed once again, but with a guilty and scarred conscience, Remy returned to his thieving ways. Stealing and fencing his goods to survive, he returned to New Orleans but avoided the Guild. While there, he encountered a young African girl with white hair. She couldn't remember her past and had turned to stealing to survive on the streets. Remy took her in and they began to work together. They made an excellent team even as Remy helped the girl escape the Psionic known as Shadow King. In the end it turned out the girl was Ororro Munroe, Storm, from the X-Men. Because of his care for her, they'd come to love each other like siblings. Knowing he, too, was a Mutant and had no place to truly call home, Storm sponsored his membership into the X-men. It was there that Remy found the true love of his life. A beautiful, sassy and headstrong Southern Belle who answered to the nickname 'Rogue'. The two had some rough times early on, with Rogue being standoffish and solitary due to her powers and the risk of absorbing others through skin contact. Remy, however, was persistent and a relationship began to build. Remy was willing to forgo the physical aspects simply because he believed Rogue was worth fighting for. The X-Men and Remy, answering to Gambit as part of the team, shared many adventures and exploits together. After the X-Men aided the Shi'ar in space. On returning, their ship crashed into the Antarctic near Magneto's former base. They were taken inside and Gambit was placed on "trial" for his crimes against the Morlocks. Rogue was forced to absorb his memories to verify the truth of his actions in the death of the Morlock society. Driven mad with anger over what Remy had done, Rogue destroyed the courtroom and, taking Remy with her, erupted through the roof and out into the frozen wastes of the Antarctic. She dumped him, telling him they were through and that she couldn't live with him after what he'd done. He was left freezing to death, alone and without help. He was found by one of the robots from the base. He was still hungry, cold and helpless but in exploring the fortress, he found an energy being that was held captive. They agreed to a bargain - he would offer the being a host body and she would aid him in survival. The 'pair' was found by a being known as the New Son. He offered aid if Remy would come to work for him. Accepting, he took missions from the New Son including a trip to the Savage Land. In the course of his assignments, he encountered Storm and Kitty Pryde while trying to obtain the gem of Cyttorak. They convinced him to return to the X-Men to resolve the past. He reluctantly faced Rogue and explained to her, finally, that her reaction was really his own self loathing and disgust for his role in the death of the Morlocks overpowering her. She did what he 'wanted' to have done to him. Yet after she professed her love, he was unable to reciprocate as the energy being, Mary, was jealous of Rogue and threatened to kill her if he tried to return to her. While things remained tense between Remy and Rogue, he continued taking assignments from New Son, obtaining rare and obscure items as requested. Parts of an ancient spacecraft were amongst them. During this same period his powers began to grow and his control along with them. Fearing that the energy being, Mary, would be detected and the consequences, he stalled on having Moira MacTaggert examine him after his miraculous escape from his frozen isolation on Antarctica. When the truth was finally discovered and that Mary wanted to merge with Remy to create a new life form, she was forced to escape his body. She was tracked down and eventually captured in a containment unit created by Beast based upon Magneto's original design. During a trip back in time he had an encounter with a younger version of his adoptive father Jean-Luc LeBeau and a younger Dr. Essex AKA Mr. Sinister, and had his restored to their full potential. He used them to return to the present. Not long after, New Son revealed his true nature. First, his name was New Sun. This was a revelation based upon his true power. He was an alternate version of Remy himself. His powers flared out of control, killing all on his home world. With Remy's own powers so high, the New Sun brought together a group of mercenaries to hunt and kill Remy to prevent such a fate for this reality. In the final battle, Remy's powers burned themselves out it seemed, but he did defeat New Sun in the process. Remy returned to his life as a thief. In the process, "befriending" the man called Vargas, who had become the primary enemy of Storm's X-treme X-Men team, in order to steal a powerful diamond that was part of the fabled Madripoor gem set from him. Not long after, Remy asked Storm for her own Madripoor ruby - a gift from her mother. However, a warrior from another dimension named Shaitan appeared, having the same intentions. Stealing the gems from Remy, they were used to create an energy needle at the Madripoor temple using Gambit's own mutant powers as the focus to create a portal through which Shaitan's master could send his forces to invade Earth. The X-treme Team, and Rogue in particular, set about to find Remy and the Madripoor temple. They found him, barely alive just as he managed to bring the temple down in collapse. Rogue, however, determined to save him threw herself atop him just as Vargas entered. He drove an arcane sword through her back and through Remy's chest, nearly killing them both. Rogue was able to stop Vargas before collapsing. Remy was worse off, however. Nearly dead even though Beast fought to save him through emergency surgery. Using aid from Phoenix, Rogue's spirit followed him into the limbo between death and life. He tried to get her to release him, feeling finally at peace, but Rogue refused, bringing him back to the realm of the living. Both did recover, however their powers had apparently burned out and gone dormant. Deciding to take time off to make a relationship work now that they could touch, the two moved to California to Valle Soleada, a city where humans and mutants lived in seeming peace. Most of the time. The rest of the X-treme Team came to stay with them and they began to aid the team regularly. Remy aided Storm with a plan to approach the President with a proposal on a Mutant Police force. Remy and Rogue helped the X-treme team finally beat their enemy Bogan. Remy showing amongst his traits, a degree of immunity to telepathy, despite his lost mutant powers. Then there was a Mutant terror attack on New York City and the X-treme team returned to help aid in the rescue and relief work. It had been some time since their injuries and Rogue felt Remy's powers should have returned. She talked Sage into helping her with a plan to jump start Remy's powers. She succeeded in the plan but Remy was unable to control his powers with such a rapid return. While Storm believed Remy needed more time to readjust to his powers, Cyclops didn't. He teamed them up on Havok's X-Team and on the first mission, a trip to China, Gambit charged a card which exploded prematurely in his face, blinding him. Being blinded did little to deter Remy's independence or hardheadedness. He got around using his staff as a cane of sorts, relying on his hearing and memory for the layout of Xavier's Mansion. However the emotional aspects were harder to deal with and he held Rogue somewhat responsible for the situation since she was the one to take matters into her own hands and asked Sage to "jump start" his powers rather than letting them return when nature willed it. Things between the two were tense and strained, once again, and both spent time apart, throwing themselves into training students at the Academy. Eventually the two were drawn back together and sought relationship help from none other than Emma Frost who began to counsel the two and set up telepathic 'sessions' for them to work on their relationships and intimacy. Rogue again approached Sage about Remy's sight. Sage, once more, jump started his powers and it healed his vision. He and Rogue began to work on their issues, moving into the same room in the mansion, though separate beds. Then a very attractive new student arrived at the Academy, a young woman named Foxx. Remy began to dwell on her and Foxx reciprocated, flirting openly. It affected Remy's attempts to reconcile with Rogue, such that he imagined Foxx when in the sessions he and Rogue had with Emma. Things came to a head when Foxx, really Mystique, kissed Remy while impersonating Rogue. Realizing things were not as they seemed, the truth came out that it was Mystique trying to meddle in Rogue's life. Remy realized just how dangerous his own flirtatious habits had become and how they were placing his true chance with Rogue in jeopardy. He'd come so close to ruining everything with Rogue that it shook him badly. With restored sight, Remy continued teaching at the Academy, trying to resolve the issues between he and Rogue and face his own demons. He also struggled to regain control of his powers; powers that had inexplicably returned at their strongest potential ever. The cause for this heightened restoration wasn't clear - either Sage's second tampering, or some other unknown cause. When Apocalypse put his plan for mutant survival into motion, Remy joined him as a double agent and was placed as one of his Horsemen. Remy went insane after Apocalypse was defeated and accompanied Sunfire to Japan where the two encountered Mr. Sinister. He sent them to the Island of Providence to confront Cable. The ensuing battle ended when Cable set off a massive explosion that destroyed the island. Returning to Sinister's headquarters, Gambit remained loyal to Sinister but maintained his allegiance to the Xmen secretly. That allegiance was demonstrated when he stopped Scalphunter from killing Cannonball. Yet it left his loyalties unclear to most given he also betrayed Sinister and the Marauders by destroying Destiny's diaries. When the X-Men attacked Sinister's base, Wolverine went after Gambit and tortured him for details regarding the Messiah baby. Gambit prevented Bishop from killing the baby and then fled with the baby and the Marauders. The following confrontation on Muir Island found Sinister killed by Rogue's runaway powers, Rogue's powers temporarily cured and held in check by her contact with the Messiah baby, and Gambit delivering the baby to Xavier to safe guard. Learning that the Assassin's Guild had targeted Xavier, Remy prevented the attack and stopped the assassins. Finding a list of other targets, Gambit and Xavier attempted to track them down to warn them. Xavier was again attacked by the Assassin's Guild and kidnapped forcing Remy to team up with Sebastian Shaw. Rescuing Xavier, Remy then accompanied him to Australia to find Rogue. After an emotional journey, they found her and Xavier was able to help her gain control of her powers. Remy and Rogue discovered she could now touch others and shared a true kiss together. Travelling then with Danger and Rogue, the three joined the X-Men in San Francisco. The city was rocked by anti-mutant riots and demonstrations and Remy set out to locate some missing X-Men students. He encountered several mutants chased by HAMMER agents and eventually Danger and Rogue help him fight off Ares. Stealing a HAMMER tank they escape, later fighting Moonstone (as Ms. Marvel) and Norman Osborn's Dark Avengers. Remy was able to finally destroy the Omega Chair Osborn used to try and rid the world of mutants but his latent persona as the Horseman Death resurfaces briefly and unsettles Remy. Shortly after, Gambit travelled to Limbo to help rescue Magik. While there Death's persona flared and Remy turned on the X-Men, warping Dazzler and Northstar into similar beings. In a confrontation with Cannonball, Magik and Pixie stab Death with their soul daggers and Gambit is restored to himself. Not long after, Gambit began to mentor Laura/X-23. After an incident in New York, Gambit and Storm discuss his role in mentoring Laura and they later encounter Miss Sinister and a hidden clone manufacturing facility. Travelling to Madripoor, he and X-23 seek out Daken but must let him go to save a boy from being kidnapped. They later confront Daken but he and his ally Colcord. 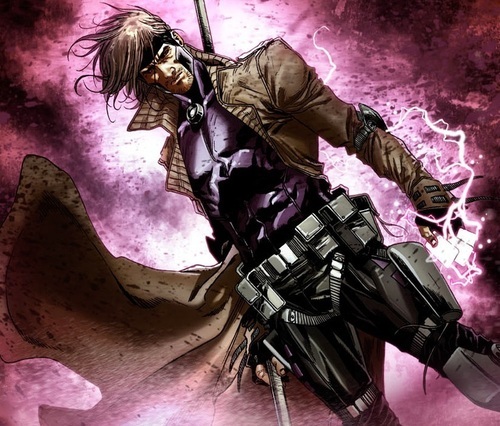 Remy then took a job from a man named Cich - a convoluted plot that saw Gambit: infected by an arcane starfish shaped relic, a nearly immortal mother seeking to heal her dying daughter, witnessing the death of both mother and daughter, becoming an enemy of the Crown by coming into conflict with MI:13, and eventually Cich killed and Remy returning to the role of leader of the Thieves' Guild. Lorna would then recruit Gambit to work with her in X-Factor along with Pietro. Their exploits eventually bring them into conflict with the Thieves' Guild and Remy was forced to reveal his role as current King of Thieves. Since the end of Secret Wars, Remy frequents Xavier's School though he is not currently a teacher. Taking time for more self-searching, he works with the X-Men as requested. Remy's life has been a constant roller coaster to put it mildly. From his less than wholesome upbringing as a street urchin/thief in Fagan's care through his time as a teen in the Thieves Guild. He learned the value of 'family' in whatever form it might take, but his views on 'right' and 'wrong' are completely subjective and influenced heavily by his years on the streets. Rules and laws were broken with impunity, take what you can, give nothing back. He learned the value of being charming, using his empathic abilities to get what he wanted, to use others to achieve his goals when necessary. He learned to be confident in his abilities, in his skills and talents. Cocky even. After all, there are few that are truly as good as he has become as a thief, a fighter - and as a lover. Or so he thinks. He learned to hide his true self, his true feelings, fears and desires, behind a veneer of bravado, charm and confidence. It's that tendency to withdraw, to hide his thoughts and concerns that have affected his relationships - primarily with Rogue. When his defenses are down, he can be very understanding, caring and compassionate. Though he often feels those things have less a place in the public view. Which rolls back into the heart of his problem in expressing himself. He learned to be self-reliant and only after joining the X-Men did he begin to learn the value of having true friends and family to fall back on. Even so, he still falls into his old habits on occasion, trying to do or solve things on his own, being too proud and stubborn to admit he needs help. And yet, there is almost nothing he would fail to do for his friends and family. It's almost self deprecating in a way; He's determined to make himself suffer but won't let others he cares about suffer. That has, however, slowly changed over the years but he has yet to fully beat the demon back. He is a quick learner, able to adapt as things change around him. He can improvise or think up new plans on the fly. And when his skills and talents fail to get him out of trouble, his Empathic Charm kicks in and he attempts to fast talk his way out. He can sweet talk and fast talk better than almost any con-artist around. Not that it succeeds every time, but there are few women - or men - that could deny he as a way with words that could be admired. Or despised. Remy is as complicated as he is simple. He has always had an issue with others accepting where his loyalties lay as it were. Growing up as a thief, fighting for everything he could gather, he learned to play his cards close to the vest in relationships, emotions and desires. Still he desires to see things better for Mutant-kind and acts according to what his vision of "better" is, which may not always align with other's own views. Still he acts with the best of intentions, even when he is making deals with any given devil. His core motivations are to have a better life and to be happy. It just seems those things are not, often, achievable in the long term. Remy's goals after all this time are to keep the Thieves' Guild running, to help out when/if the Xmen ask him to and to keep a tight control on the (currently deeply repressed) persona of Death in his psyche. Remy's mutant powers have manifested in several ways. In the physical aspects, he has truly super human quickness and agility. Specifically, he can block or dodge bullets because of his reflexes. No, he can't do it with bare hands, but if he has an object (his staff, etc) he can deflect them as long as he can see them and his attacker. He cannot "sense" an attack from behind. When moving, he can seemingly change directions in mid air. Not that he can stop his momentum, but he can easily change orientation and position so that when he comes down he can instantly start off in another direction. He can do flips and spins and kicks much like Beast is able to do and can perform amazing acrobatic feats every cat burglar would be green with envy to possess. The mutant state of his muscles, tendons and joints all combine to give him a huge edge over nearly every opponent. Dissipation - He is able to control his charging up to a point but there is a point of no return when one is working with nuclear fission after all. In objects smaller than a bus he can dissipate the charge. Anything larger and the difficult directly correlates to the size. If he were to charge a building? The same amount of effort put into charging it has to go into cancelling out the charge before it explodes, etc. If he uses more energy to charge it up than he has left to focus on dissipation. bad things are going to happen and everyone better run fast to reach minimum safe distance. Remy's secondary mutant ability has been called Empathic Charm. He is able to control the way others receive his words. Much like a form of hypnotism. He can use this ability to sweet talk, fast talk, stall, or disarm a volatile encounter into something much easier to deal with. In women, when he uses it, it tends to make them see him as incredibly suave, charming and as a silver tongued Ladies Man. With others, he seems very personable, easy going and just "one of the guys" as it were. This ability is more effective now, as with his Charging abilities, giving him an even greater social weapon than he has had in the past. Remy has demonstrated over the years a resistance to mental attacks and mind probes. He was able to block Psylocke's probing into his mind even while unconscious. He has been able to block Psionic attacks against others near him as well (Shadow King attacking Ororro for example). It has been supposed that it is an extension of his Empathic Charm, and perhaps that is the case, or at least a large part of it. While his power is very strong, especially now, it would still be susceptible to the likes of Professor Xavier and possibly even Jean Grey or Emma Frost though perhaps to a lesser extent. "What is that, Holiday? Twelve hands in a row? Ain't nobody that lucky!" "Why Ike, whatever do you mean? Maybe poker's just not your game. I know! Let's have a spelling contest!" Remy has an innate talent for the "sport" of gambling. Poker in particular. He knows every variation, every optional rule, all the tricks and the statistics. He knows all the shuffling and dealing tricks for cards, all the methods of cheating, how to stack and "play" with one's poker chips. It's just something he was born into. If he weren't so busy being a thief and saving the world with the X-Men, Remy would be a champion in the professional poker playing circuits. As it is, he cleans up nicely whenever he decides to join a game. Even when he plays fairly. It goes so far beyond a simple talent. Remy has a sense that is uncanny in regard to his surroundings and being able to navigate through them. Specifically, when he has been blinded or unable to see (Darkness, whatever) he has shown an ability to maneuver as if it were broad daylight and he were able to see with clear 20x20 vision. This doesn't seem to necessarily be a part of his mutant ability, yet he is able to combine it with his powers, such as to blindly launch charged cards at opponents with amazing accuracy. It also means that he can excel in blind fighting (see skills). Remy has a collapsible staff that he carries with him at all times. It's been custom made for him and is non-conducting. He can extend one end to use it more like an Escrima stick, or both ends and use it as a full Bo-Staff. He has used it as a cane in the past when needing to get around. It has just enough flex to it that it can also double as a vaulting rod to increase the length of a jump or to propel him higher into the air toward a roof top or ledge. It is one item he is never without, even when prowling the city on a Saturday night. Remy keeps enough decks of cards around that he might as well run his own casino. He has at least two full decks on him at any given time and has cases of fresh, sealed packs in each place he considers home. A gambler can never be without cards, and a mutant able to use them as projectiles needs them even more than that. Besides, it's hard to carry poker chips. They rattle. Remy has a motorcycle. But not just a simple bike, though it could likely be viewed as "just" a bike by most. It is, however, a Ducati Supersport 1000DS; A very high end street bike designed for high speeds, fast corners and turning heads in under a second. Finished in glossy black with graphite anodized aluminum frame tubes and red powder coated rims. The net effect? The coloring and appearance look much like the owner of the bike - two intense and dazzling red irises set into an exotic black sea. For his part, the bike has after market additions - better suspension, prototype run-flat tires that allow him to ride at over 100mph, a prototype intake and exhaust system that increases the engine from 95 to 115hp and a Marelli prototype racing CPU from the pro racing circuits to improve over all engine performance and monitoring. It has little cargo space but Remy carries three spare decks of cards, a backup collapsible staff, a second set of lock picks and a pair of night vision goggles all crammed into a small securely locking storage compartment under the seat. The bike also has a prototype security system that locks out the ignition and fuel systems. Sure, someone can pick it up and carry it off if they wanted to try, but Remy also has a homing device inside the tube frame. To get it out one has to first find it, then cut the frame open to extract it. This bike is Remy's pride and joy and he's stolen only the best components for it. He'd be very displeased if someone were to try and steal it back - in part or in whole. Remy was a member of the Thieves Guild from childhood. His foster father Jean-Luc was the leader of the guild. Later, Remy and Belladona were married to try and unify the Thieves and Assassin's guilds. It failed. However, in not too distant times, Remy was a part of the successful unification of the two guilds to form the Unified Guild. Remy has served as the leader of the guild and is generally viewed as the successor to his father, but leaves day to day operation of the guild to others in New Orleans. Remy has access to the resources of the Unified guild - be it equipment, information, contacts, aid as needed, etc. He will go to their aid as well because it is truly his first family. Remy's mother-figure and source of trusted advice in New Orleans. Tante Mattie is an older woman who makes her living as a fortune teller, among other things, in the French Quarter. She has an ear to the ground and a seeming sixth sense to know information. Remy knows that he can always count on her to give him a straight answer and assistance when needed - even if it may also come with a stern lecture. Lectures free of charge. And if she should ever need help, he'd be there before the dust could settle. Remy is a member of the X-Men. He's also one of the instructors in Xavier's School. He has access to all of the training materials, the X-Men resources, data and equipment. He has access to the Danger Room. He can use those resources and does not abuse that privilege. He can also call on the X-Men to help him if needed, that's part of being on a Team. And just the same, he'll go to the aid of any of the X-Men in trouble. Remy has body armor that he will often use when going on missions for the X-Men. Or when he is performing a rather tricky burglary. It isn't bulky, so it doesn't have the same kind of stopping power that heavier armor might. But it does afford protection against small caliber guns, knives, can absorb basic shocks such as prods/stun sticks, and affords strong absorption of blunt impact: Punches, kicks, etc. Anyone can call themselves a thief, just like anyone can call themselves Commodore. It doesn't mean anything if you haven't got the skills, the tools, the talent to back up the title. Remy has every one of those in spades. As it were. He has "obtained" the highest quality, most advanced tools and equipment for breaking and entering, for bypassing mechanical and electronic locks and alarm systems, for detecting and defeating passive and active surveillance systems and for making his chosen career as a thief easier in general. If there is something he wants, that he hasn't got on hand, a quick call or visit to the Thieves Guild or one of their contacts will net him the desired item with no questions asked. It's good to be the King.. er.. Prince. Of Thieves. Remy has more than a few contacts. Not just in New Orleans, or North America, but internationally as well. He has informants keeping an eye out for items of interest to him, tantalizing tidbits of information, anything and everything. He has suppliers, he has fences, brokers. He treats them all well as long as they treat him well in return. Honor amongst thieves and all that, after all. Needless to say, they are more than happy to work with him. He gets results. They may not always be as fast and responsive as working within the Unified Guild, but they know who he is and his position. And unless they just have a death wish, they aren't likely to double cross him without a very good reason. "..I never saw a rich man who didn't wind up with a guilty conscience." "Already got a guilty conscience. May as well have the money, too." Remy is a master thief, one of the very top few in that field in the world. He can do things, get into places, bypass systems that almost no one else can. As a result, if he takes a job, he'll be compensated for his time and effort very, very well. And when he works on his own, it's certain to result in yet another financial gain. His bank accounts are spread world wide under many aliases in many countries. If it's a major country, or has a civilized city and culture, he likely has an account with a large sum of money at his disposal to be accessed. A thief can never be too cautious or fail to plan carefully enough. To say that Remy is very wealthy would be a mild statement. Remy has places to stay around the world. They're not lavish and they're not expensive but he has several small apartments that he keeps for when he… travels.. They have room for up to 4 occupants comfortably and extra clothes and hidden compartments with additional thieving equipment - and fresh decks of cards. Remy carries a dozen throwing knifes and spikes on his person. These can be used to "jimmy" a window or door just as easily as being used to pin someone to a wall or as a charged thrown weapon. "No. Johnny Diamond wasn't a Card Sharp. He was good. He was very very good. He didn't need to count cards to beat you." This goes hand in hand with the special of the same title. Remy is more than a Card Sharp he really -is- "That Good" at playing cards. He can shuffle, deal and perform any trick with cards better than most professionals. Cards are more of a living extension of his personality. A large part of Remy's attacks involves the art of throwing. Primarily playing cards he has kinetically charged up and then throws as missiles to explode on contact, he also can throw knives just as accurately. His aim is very good when it comes to throwing hand held objects or 'flipping' cards as - as weapons or otherwise. He could probably clean up pretty well at a game of darts too. Remy can do more than just ride his motorcycle. His reflexes are quick and his balance solid. He can drive at incredible speeds with precision and perform stunt-like maneuvers. And he can just as easily tool on down the road on a Sunday drive as if nothing happened. Among other things. Remy is a Master Thief and he is the heir to the Unified Guild's leadership. If he weren't one of the very best at all of these areas, he would never be given the respect and authority to go with being so high up in the guild. Remy grew up on the streets. He learned from the best thieves in the Guild and he was observant. Not just to their instruction but -how- they taught. The methods. He remembered it. Over the years he has had the chance to teach and instruct others in the Guild. Now, Remy uses his life lessons, and his teaching skills to instruct at Xavier's School. Remy is incredibly agile and has an almost flawless sense of balance. As a result, he is able to move and react in ways that would leave others flat on their backs. He can dodge and twist and attack often in the same motion and knows how to make use of his surroundings to his advantage. This helps with his thieving ways as much as it does his fighting prowess. Thanks to the adaptation his body has made to his mutant powers, his skill is almost the stuff of legend. He has a sense of balance that a cat would be jealous of, able to walk effortlessly on extremely thin cables or wires, even climb up surfaces that others would swear were impossible to scale. Try playing capture the flag with this guy - He may not be built like Detroit's Barry Sanders was, but he's got moves that are no less spectacular. In a fight he looks like a star of so many so-called "Wire-Fu" movies that feature amazing stunts and moves that seem so utterly impossible. Remy is trained in martial arts. Though he doesn't tend to favor any one style, blending them together with his own street fighting moves to create a very potent offensive and defensive arsenal. Growing up in New Orleans, one of America's most diverse melting pots, Remy picked up various languages aside from (bad) American English. The languages he is fluent in are: Louisiana Creole, Cajun French, French and even some Haitian Creole. "Not yet. We wait for the opportune moment." "When's that? When it's of greatest profit to you?" "May I ask you something? Have I ever given you reason not to trust me? Do us a favor . I know it's difficult for you, but please stay here and try not to do anything… stupid." Remy is known for his cunning and tactics. He could be considered more of a predator than charging bull. He picks his fights and often to the frustration of his teammates will seem to be inclined toward passivity than fighting when he is really just playing a game of poker - luring his opponent in until it is to his advantage to strike and take the advantage. Or to just do the most damage. A poker game isn't won in a single hand, but you can take a lot of the chips away leaving your opponent with little room to maneuver. He will also make sacrifices if it will lure his opponent in and catch them off guard to then give him the edge he needs. Either in poker or in fighting - being captured, feigning weakness or injury, etc. This is more of an offshoot of acrobatics, but Remy is very fit and active. His stamina and endurance are high because he works out and trains constantly. While he isn't an Olympian, he certainly has athletic prowess. Remy has some skill as a mechanic. He's no Forge, but who is? If a vehicle has trouble, or he gets a nifty new component to add to his bike, he's more than capable of working on it or assisting in repairs. He knows his way around a wrench as easily as a set of lock picks. Remy has Empathic Charm that acts as a supercharger but he has skills it builds off of. Remy, even without his powers, when they were lost, was still an incredibly seductive and charming man. He seems to know just what to say to woo a woman. Or at least that seems to be the popular theory. Not to say every woman is at his beck and call (Rogue would probably have something to say about that), but most are likely to be receptive. Something Remy has grown to be quite used to. It's not clear if it's just a game, or friendly interest, but regardless, it's a challenge. Remy is fully versed in staff and stick fighting. He can use his bo staff with deadly force if needed and with pin point precision. He can use it for offensive and defensive fighting. Remy has traveled the world over many times. He understands how to get by in most countries, he often can rely on his rugged looks and charm to befriend locals but he has come to acquire much knowledge about many cities in the world - and the darker underbellies in each that form up the criminal elements. More than just blocking a punch or a kick. Remy's heightened agility gives him the means to dodge and directly avoid being hit much easier than most. Using his acrobatics, he can weave in and out of a fight and avoid the blows that could take their toll on his body. His body has far more speed and flexibility than a normal human and as a result, he can do seeming super-human feats. His reflexes are fast enough that while he might not be able to necessarily dodge a bullet, he can use his staff to deflect them if he sees them coming. Remy has better than average computer skills. He isn't a hacker or programmer in that sense but he can use the X-Men computers for monitor duties, he can control the X-Jet's systems and he knows how to use a cell phone (more than some people these days!). He will often employ high tech bypassing programs to get around security measures but, again, if it requires pure hacking prowess, that isn't his forte'. Call in Kitty! With Remy's innate Spatial Awareness, he is a deadly blind fighter. He knows what is around him even if it's pitch black. Just how, he hasn't said. But he -can- and in the end, it also means that he can move in utter darkness and disable opponents with skill just this side of a true Master of Martial Arts. It also means that if his vision is blinded (Flash bomb, whatever), he is anything but helpless. Remy is nothing if not cocky. His master thieving skills, his reliance on his Empathic Charm, on his wits and on playing the odds all combine to give him an attitude that could be nothing less than cocky and overconfident. The trouble is, *most* of the time, he really is "that good". It doesn't change the fact, however, that it can be infuriating to his teammates, to Rogue, or to others. And the attitude can cause the best laid plans to backfire sometimes. Remy's aid of Mr. Sinister in assembling the Marauders and then leading them into the Morlock tunnels and the subsequent massacre of the Morlocks left an indelible scar on his mind and conscience. He has done many, many things he may regret - letting Geneviere die so he could save Henri in France as a teen - being one of them, the Morlock Massacre he bears alone as his own personal cross. He believes he should have realized what Sinister was planning with a group such as the Marauders. And perhaps he should have. But the past is the past and unchangeable now. Remy, however, will not let it go. Ever. He hid this incident from his fellow X-Men till the "tribunal" held by Magneto at his old Antarctic base where Rogue was forced to absorb his memories. And yet, even after facing the X-Men, clearing the air as it were and explaining his side of it, he still holds the guilt, the regret, the sorrow of being the one that caused the death of the Morlocks. And even though he is glad he saved Sarah, who would become Marrow, seeing her is a constant reminder of what his foolish, overconfident, rash, naïve (and any number of other negative descriptors for himself) actions cost Mutant kind. He alone bears it and he will carry that guilt, blame and responsibility to his grave and he will probably never forgive himself. The "real" Remy is someone that very few people have ever gotten to meet. Rogue has gotten to glimpse the real "him" in bits and pieces over time and has probably pieced together the best idea of who he really is. Storm has a good idea from the time she and he were in New Orleans when Shadow King was after her. He has become very good at maintaining an almost perfect 'poker face' as his persona. It's both a coping and safety mechanism for himself, learned on the streets as a child. If you don't let anyone in, not only can't you be as easily hurt, you can't be as easily double crossed or betrayed. The trouble is, it also means that true friends have trouble becoming…true friends. After encountering the New Sun and working for him until the revelation that he was really an alternate version of Remy whose world was destroyed by his out of control mutant powers, Remy has some concern that this might happen to him, here on Earth. He knows his powers have flared several times, recently peaking at levels they've not been to in years (not since defeating the New Sun). It weighs on his mind — WILL they flare so wildly that he, too, would end up destroying his own world, all his friends, those he loves? He tries not to dwell on it too much, but it is always lurking in his mind. And as he tries to focus on his restored powers, there is an element of doubt that may yet cause him to struggle at a critical moment. Only time can tell. "Wyatt Earp is my friend." "Friend? Hell, I got lots of friends." If you want to get to a hero, you go through their friends. Remy is no exception. If someone were to go after one of the X-Men, one of his few friends outside the X-Men, or if the Thieves Guild were in trouble, he would (predictably) come to aid. This can always be used against him, even when he tries to minimize the risks. Remy's Empathic Charm works most of the time in his favor. Wooing women into doing what he wants, giving him information, or just to annoy some other guy because it seemed like fun at the time. It also works to help him befriend people in general. To fast talk them into helping him. However. Not -every- person in the world is susceptible to his charms, strong mutant powers or not. Sometimes? They react violently in the opposite manner. Emotional manipulation doesn't always work the way one desires. Or…. weak willed women (or men…) might just fall madly in love with him from what would simply be 'normal' tampering.